Fancy frosted sugar cookies from cake mix are yummy, gorgeous sugar cookies piled high with frosting and laced with sprinkles. Everyone will think they came from a bakery! These sugar cookies are beyond fab! My family loves them and requests them often. In fact, I made a batch last night for myself and three teenage girls. While we watched a movie, we ate the entire two dozen! They are addictive and delicious. They are not only yummy, they are pretty. White. Speckled. Fluffy. Multi-colored. At Christmas, I love to serve them with Snow Men:-) At Easter, they blend in beautifully with the pastel flowers, bunnies and eggs. Because I make these cookies so often, I keep several boxes of white cake mix on hand at all times. Any time we need these cookies, they can be whipped up in an instant. I keep several kinds of sprinkles in various sizes and colors. These cookies can be decorated any way you like to suit the occasion. 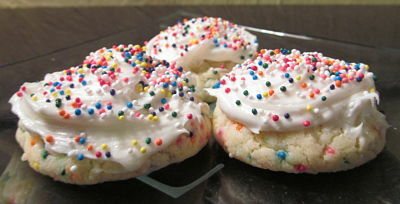 A note on cake mix: Pillsbury Moist Supreme classic white makes the most moist, fluffy cookie. 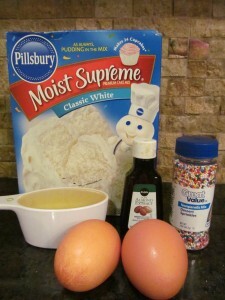 I’ve tried other cake mixes and always come back to the Pillsbury for this recipe. The pudding must make the difference. A note on extract: Almond extract is the secret to making these taste like bakery cookies. It imparts a richness and depth that vanilla simply can’t match. You can make these cookies two ways. Before baking, you can either stir sprinkles throughout the batter (best if you aren’t frosting the cookies), or you can roll the dough into sprinkles before baking (best for frosted cookies). In a pinch, you can frost these with canned vanilla frosting, but the homemade is SO much better! It is light, fluffy, and adds another layer of almond flavor much like the frosting found in bakery cookies. I’d love to hear from you if you try these, so please feel free to leave comments! Thanks so much for stopping by. Be blessed, and stay savvy!!! In medium size bowl, combine cake mix, eggs, oil, and almond extract. Mix well on low speed of electric mixer until dough is well formed. 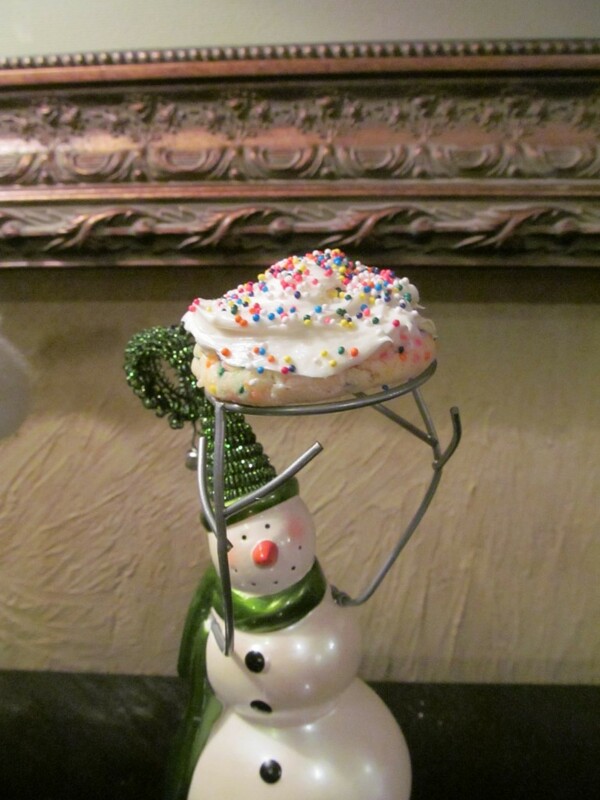 For sprinkled cookies, dip one side of the cookie into the sprinkles. For cookies you'll top with icing, pour all sprinkles into dough, and mix well before rolling into balls. Add powdered sugar; mix until fluffy. Add extract and water; mix well. Spread on top of cookies. Bertie, I am sorry that yours didn’t turn out. I wish I knew what happened, as this recipe has always worked for me. Let me know if you figure out what went wrong. Thanks for commenting!